My daughters both attended a candy camp this year, and they absolutely loved it! I’ll admit, I was a little apprehensive about it…would they overindulge on sugar for 2 hours straight? Thankfully, my fears turned out to be unfounded. 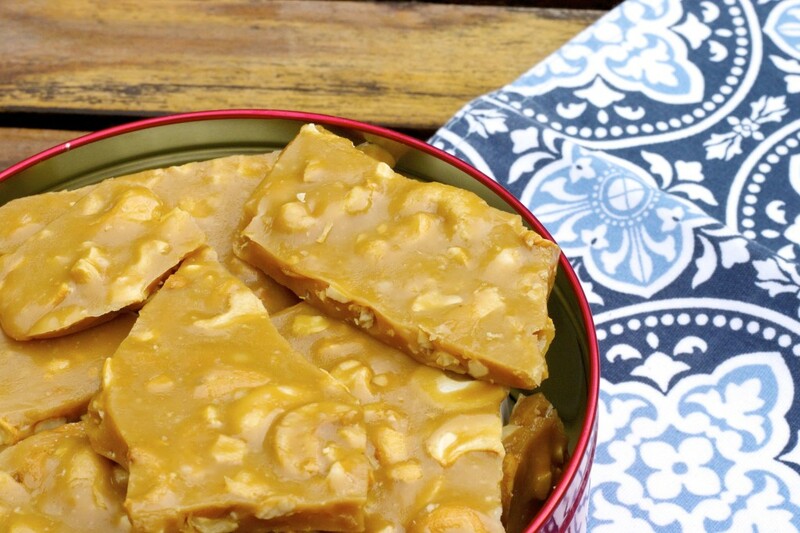 They made a new recipe each day for one week, and this buttery cashew brittle turned out to be their absolute favorite (mine too!). Since camp, we have made this recipe at least 3 or 4 times, and the candy is gone within a day! 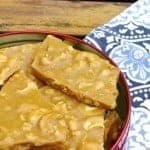 Now, I’m not a fan of the traditional peanut brittle, which is a tiny bit harder and sometimes tastes too much like burnt sugar to me. But this? This I looove! I think it’s because it contains cashews instead of peanuts and more butter – well what can I say? Soooo good! Let the mixture cool for 10 minutes and then transfer to the refrigerator for 5 more minutes. I made this recipe 4 times and every time it was perfect and delicious! I had the best compliment from my mother-in-law that it was the best brittle she has ever eaten. Thank you for sharing this recipe! I made it and it turned out perfectly! I’m getting ready to make a second batch! just made it and im very disappointed, been in the fridge to chill and didnt set for 2 hours and it set like gum? wont pull apart let alone break apart? Oh no! Did you use a candy thermometer? I’m not sure what happened…the recipe is from a candy instructor who teaches candy making and we have had success with it every time – so sorry to hear you didn’t have any luck with it. This looks wonderful. I’m enjoying browsing your recipes here!